BIRGIT ULHER & CHRISTOH SCHILLER - TULPE SCHICHT BRILLE (CD by Inexhaustible Editions) The Slovenian label Inexhaustible Editions is rapidly growing into a powerhouse for more radical forms of improvised music. Here they present three new releases to proof their extremity. The first one is by Birgit Ulher (trumpet, radio, speaker and objects) and Christoph Schiller (spinet, electronics and objects). The spinet is of course not a very common instrument when it comes to improvisation. The five pieces here were recorded in Schiller's atelier (oddly enough not called 'studio' on the cover) and contains some intense music, perfectly outlining the sort of improvisation that this label deals, and players like Schiller and Ulher normally play. Much of this is quiet, yet never bordering too much on being all-silent with just a scratch here and a tick there. There is, as far as I can judge always something to hear on this disc. The spinet and trumpet are recognizable as such to most extent, the first being plucked and the second playing longer notes. To that this duo adds the resonating sounds of objects on a speaker, of on going manipulations by hand manipulation of objects and a bit of static crackles from radio and electronics. There is some fine controlled interaction going between these two players, leaving room for each other to expand their sounds, adding and subtracting when necessary and within the limited range of their means there is a lot to be done, so the level of variety is quite big here. It moves between the gentle and the extreme, between quiet and less quiet and it is throughout a beautiful release. My ongoing, absurd struggle to come to grips with the sound of the harpsichord in all its guises (including the spinet that's Schiller's instrument of choice) continues, but I'm slowly making ground. Here, Schiller (also utilizing electronics and objects) is joined by the fine trumpeter Birgit Ulher who herself adds radio, speaker and objects to her always imaginatively played and manipulated horn (it's their second recording together, I believe, after 2012's 'Kolk' on Another Timbre). The five improvised tracks are sober and investigative, sometimes--given the enhanced brass and the metallic sound of the spinet--evoking vague, mysterious mechanical operations, an imaginary steam-punk contraption. There's a fine feeling of intense focus here, no throwaway moments, as well as a very good balance between response and independence. Often, the listener has the initial impression of an answer to a sound posed by the other, but then the respondee goes off on his/her own tangent, unrelated enough to cause that listener to doubt their first thoughts. And yes, the basic spinet sound is subjugated more than enough to quell any visceral reactions I might have--sometimes the strings are plucked to an astringent guitar-like effect. Ulher's trumpet, as ever, is a fount of unusual sonorities, buzzing, clacking and dripping away but always with precision. Thoughtful, intelligent improvisation of a high order--recommended. Take Tulpe Schicht Brille’s game plan for example. On first glance it might look like the sort of conventional trumpet-and-keyboard lauded by mainstreamers; or since German Christoph Schiller favors the spinet with its obliquely-set strings, some might be fooled into thinking another lachrymose Trumpet’n’Strings is on offer. No way. The CD’s five tracks find two individualists creating idiosyncratic intonations that are often so non-specific that ascribing particular notes or tones to either instrument is nearly impossible. Assuredly the players also promote non-specificity by Ulher linking radio, speakers and objects to her horn exhortations, while Schiller, who also uses objects and electronic processing as playing tools, more frequently slaps, pops and strokes the spinet’s strings than uses the keyboard. A common strategy as exhibited on the title track, finds jangling string strums backing volatile trumpet noises that move from vacuum-cleaner-like buzzes to hollow tube echoes and mouthpiece kisses. As abrupt pauses separate each brass transformation, hissing oscillations and string jitters are also heard until each upsurge blends with others to form a solid mass. Replicated textures from each player’s exposition mean that the CD’s most characteristic improvisations are also the most aggressive, as with “Pollergebiet” and “Teich Tisch Leib”. On the latter, the trumpeter’s output is mostly attuned to blowing harsh tones against unyielding metal or actively creating new textures by scratching the instrument’s external finish before playing. On “Pollergebiet”, plucked and clanking spinet string stopping plus flanges that resemble the sound of magnetic tape unrolling are Schiller’s high frequency responses to Ulher’s narrative, although he leaves enough space so that Ulher’s repertoire of laughing gargles, sibilant growls and brassy brays can be appreciated. On the concluding “Teich Tisch Leib”, her aggressive blows into the horn’s body tube encourage sinewy plucks and string stops from Schiller, first intermittently than completely blurring with her output into a single uniform tone. 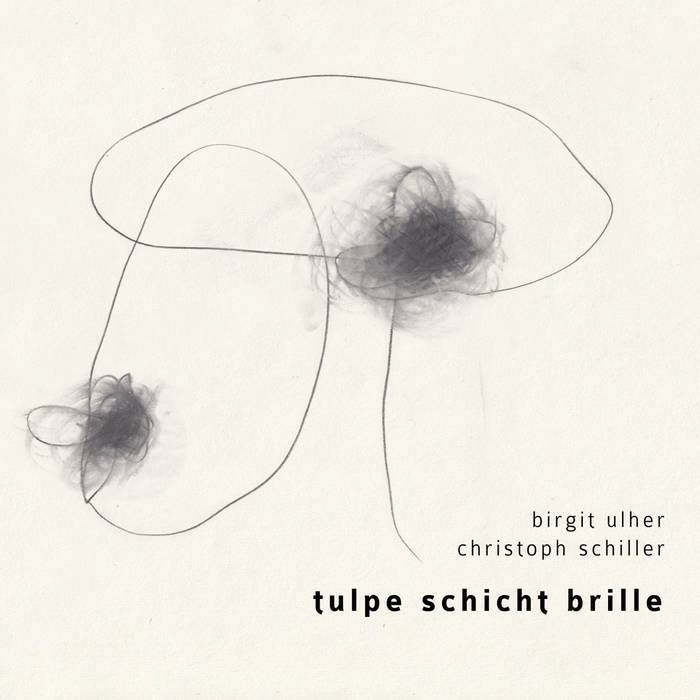 Birgit Ulher and Christoph Schiller are here with Tulpe Schicht Brille (INEXHAUSTIBLE EDITIONS ie-011), a fine set of reduced playing made in unusual fashion. We last heard Ulher doing her trumpet and radio thing on Radio Tweet, where she did it with Ute Wassermann. Ulher’s tabletop also carries a speaker and various objects, and her performances are filled with small intimate events complementing her very compacted trumpet playing. Each puff on that instrument seems very constrained, but it’s still very expressive; one thing I like is that she doesn’t feel the need to call attention to her breathing, which is something Axel Dörner used to do rather a lot. Ulher produces mysterious growls and purrs which feel very natural, and we’re not getting yet another lesson in extended technique. Composer and keyboard player Schiller, from Stuttgart, has appeared on quite a few records from Another Timbre and Creative Sources Recordings, and indeed recorded with Ulher in 2012 on the Konk album for Another Timbre. Along with his electronics and objects, he plays the spinet – an instrument which rarely crops up in an improvising context. The baby sister of the harpsichord, it involves plucking a string with the key rather than hammering a piano wire, and the sharp tone it emits is something you could use in place of dental floss. While I suppose the spinet may have featured on many florid recordings of baroque music, Schiller’s playing here is anything but florid. He will only surrender a note on very strict terms, it seems, wishing his contribution to be felt with the clean sharpness of a needle entering your arm. Tulpe Schicht Brille thus offers some very unusual sound combinations, and at their most effective the pair create (in a very low-key manner) something that’s almost alien in its unfamiliarity. There’s a certain coldness and stiffness to the performances, but if anything this only adds to the overall effect. From 15th October 2018.